Ray Bradbury has a capacity for storytelling that I’ve seldom seen matched by any other writer. The sheer power he wields as a word-artist never ceases to amaze me. Could I choose but one fiction author to grace my bookshelves, he would be a top contender. That’s high praise, but it’s well-deserved. And if you’ve never read a Bradbury book, you don’t know what your missing. Two of Bradbury’s books have made it into my reviews thus far. Now I’ll add a third. Will Halloway and Jim Nightshade – both age 13 – are fast friends. But their friendship is tested when a strange and sinister traveling carnival arrives in their quiet Midwestern town one October, flaunting the seductive promise of dreams fulfilled and youth regained. Heading this carnival is “Mr. Dark”, a sinister being with a multiplicity of tattoos all over his body – one tattoo for each soul ensnared. Countering this malevolent presence is that of Will’s father, Charles Halloway, a quiet but courageous man who must be wary of his own secret desire to be young again. Something Wicked is a compelling tale of good and evil, of friendship, fear, and ultimately, hope. The characters, as typical of a Bradbury story, are unique and well-drawn; by the end of the story, I felt I knew each one personally. “Mr. Dark” is one of the creepiest, most tangible villains I’ve encountered in literature, and his minions (particularly the Dust Witch) made my flesh crawl. At the very beginning of the book, Bradbury quotes Proverbs 4:16-17, “For they sleep not, except they have done mischief; and their sleep is taken away, unless they cause some to fall. For they eat the bread of wickedness, and drink the wine of violence.” Believe me, the description fits. Perfectly. At dawn, a juggernaut of thunder wheeled over the stony heavens in a spark-throwing tumult. Rain fell softly on town cupolas, chuckled from rainspouts, and spoke in strange subterranean tongues beneath the windows where Jim and Will knew fitful dreams, slipping out of one, trying another for size, but finding all cut from the same dark, mouldered cloth. Another aspect I greatly appreciated about Bradbury’s story was its brilliant depiction of man’s willingness to part with his soul in exchange for earthly pleasures – pleasures that ultimately ensnare, no matter how desirable they appear from a distance. A man may pursue these pleasures, but he will only pursue them “till a dart strike through his liver; as a bird hasteth to the snare, and knoweth not that it is for his life” (Proverbs 22:23). However, before you walk away thinking that I give this book my unqualified recommendation, I must say there is one aspect of this book that I did not appreciate and, in fact, greatly disagree with. You see, in Bradbury’s story God is not the savior of man; man is the savior of man. God is not the answer to evil; man has the power to overcome evil by himself. Such man-based salvation is, from a biblical perspective, laughable. Those redeemed by the blood of the Lamb know the truth: “Every one of them is gone back: they are altogether become filthy; there is none that doeth good, no, not one” (Psalm 53:3). Bearing this in mind, I do think this is a book that can and should be read by discerning Christians. Apart from the humanism, there is a wealth of other thought-provoking material that will stay with you long after you’ve turned the final page. Yes, I agree, Bradbury does seem to propagate that message, which is sad. Even in Fahrenheit 451, towards the end, it seemed to be more of the survivors helping others, even with the quote from Revelation. I’ve been meaning to read some Bradbury for awhile, and it looks like this would be a good one to pick up. Thanks, Corey! @Grace: Thank you! Bradbury is one of my all-time favorite authors, and I’m sure you would enjoy his writing. 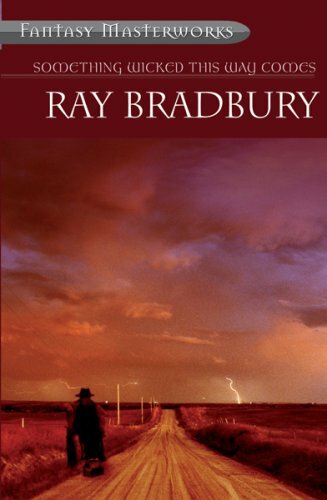 Something Wicked is a great read, as are The Martian Chronicles and Fahrenheit 451 (my fav). Great review. After reading “Farenheit 451” I have found Bradbury to be another writer well worth pursuing. I’ll add this to my list of books to read. @Michael: Thanks, and I’m glad you enjoyed F451. Great book. Look forward to hearing what you think of this one. Cory, I’ll have to give this one a try – ever read The Veldt? A good short story by Bradbury, though not as powerful as F451. Thanks for the review.